The Export Layout window lets you export some or all of the scenes in your project to layout images. This can be used to properly position scene elements when working on different aspects of the scene throughout production. 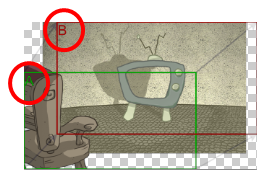 For example, a layout can be imported in Harmony to accelerate its set up and properly position the elements and camera keyframes of the scene. Also, a layout exported to .psd format can serve as the base to create the background art for the scene so that it is properly adapted to the scene’s layout, action and camera movements. Layout images can be rendered with all layers combined or with one image per layer, and can optionally include camera keyframes and movements. Layouts can be exported in .psd (with separate layers), .tga, .jpg or .png format. Select File > Export > Layout. The Export Layout dialog box opens. In the Destination Path section, click the Browse button and choose a folder in which to save the exported files. In the File Pattern field, type in a prefix or a file naming pattern for the exported files—see About File Naming Patterns. Jpeg (*.jpg): A very compact image format with lossy compression. Targa (*.tga): An image format with basic lossless compression. Photoshop (*.psd): The format used to store Adobe Photoshop projects. This format is uncompressed. Portable Network Graphics (*.png): An image format with strong lossless compression. Transparent Background: When exporting in Photoshop (*.psd) format, enable this option to render the layers on a transparent background instead of a solid white background. Base Image Size: Allows you to select whether you export at the same size as your project's resolution, at half its dimensions or at a quarter of its dimensions. Expand Render Area: Expands the area to render into the layouts. By default, only the area of the scene that is covered by the camera is rendered, and exported layout images are cropped at the edges of the camera frames. If enabled, this option adds space around the render area and captures extra details outside the camera frames. By default, the render area is expanded by 10%. You can use the input field to the right of the option to change this ratio. Scale Image Up to Smallest Camera Frame:Ensures that when a camera close-up is included in a scene, the exported image is larger so that the closest camera frame is at least the size of the chosen image size. This way, the layout does not appear pixelated when zooming in on the closest camera frame. If disabled, the size of the exported images will be based off the chosen Base Image Size and Expand Render Area options. Limit Image Size: If the Scale Image Up to Smallest Camera Frame option is enabled, this ensures images do not get scaled up too much. If enabled, images will be limited to 4096 pixels in width and height by default. Export One Image Per Layer: Exports each layer as a separate image file. If Print Camera Frames option is enabled, the camera frames and camera movements will be printed on each layer. Apply Layer Motion to Camera: When exporting one image per layer and with camera frames, if your layers are animated, this option allows you to combine the layer's animation with the camera movement that is printed on it. By following the resulting camera movement, the layer will appear to be animated just like it is in your animatic. For example, in a scene where a drawing layer moves towards the right, and the camera moves up, the camera movement that will be printed on the layer's layout image will be combined with that layer's animation, and the resulting camera movement will go up and towards the left, so that the layer itself appears to move towards the right. 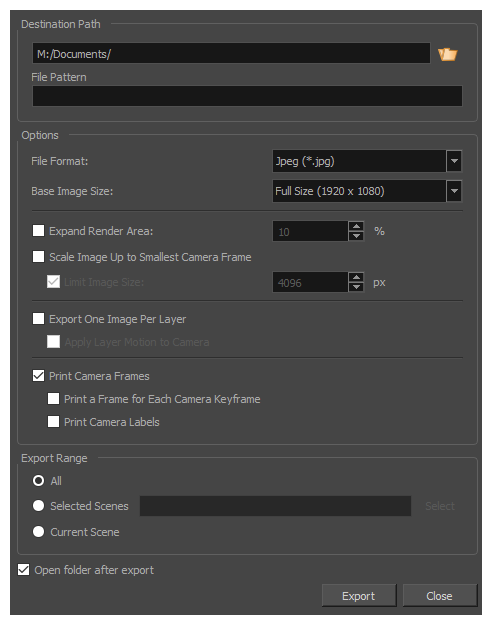 Print Camera Frames: Prints the first and last camera frame of each scene into the exported layout images. If exporting in .psd format, the camera frames will be printed on a separate layer. Print a Frame for Each Camera Keyframe: If a scene contains a camera movement with more than two keyframes, this prints each camera keyframe into the layout. Print Camera Labels: Adds the camera position label in the top-left corner of each camera frame. Camera frames are labeled with a letter of the alphabet indicating their respective order. All: Exports the entire storyboard. Current Scene: Exports only the currently selected scene. To view the location and contents of the exported folder when it is ready, select the Open folder after export option.